Donaldson was raised by his mother. His parents were divorced when he was just a toddler. His father, Levon, was later arrested and sentenced to 15 years in prison. Despite his Dad being incarcerated, his mother permitted Josh to see his father and never let anyone speak badly of his father to him. "Mom was on top of all of it," Donaldson says, "working day and night jobs, making sure I was making grades and making sure I was accounted for." His mother, Lisa French, worked at their family bar and kept Josh out of trouble. Josh also credits his uncle, Chuck Pyritz, with filling the father-figure void. Baseball is endless childhood. Grown men who never quite leave their boy selves behind. But that implies childhood as a place of gentle delights, of innocence, of sentimentally burnished memories. For Josh Donaldson, it wasn't like that. His early years were drenched in violence that no little one should ever have to witness. "I'm not going to get too colorful with it. But it wasn't pretty. The best way I can describe it is I can still remember things from when I was from three to five years old that are very vivid in my mind to this day. And it's not something I would want anybody else to go through. It not only affects the two people who are involved, but it affects the children. It definitely has had an effect on me throughout my life." Those two people: Mom and Dad. Josh was the only youngster in the household. Late one night, Levon Donaldson — at that point separated from Lisa — broke into the home and, in a fit of rage, viciously attacked his wife. It was not the first time he'd raised his fists to her. "There was no way I could help. It's a tough situation for everybody to be a part of." "At one point, the cops were looking for him and he asked me: 'Who do you want to go with, me or your mom? I was four years old. I obviously picked my mom." Their relationship — mother and son — was extremely close, bound to each other by love and mutual dependence. Lisa French, a struggling divorcee, worked day and night at the family bar, leaning on her own brother to provide the boy with a sturdy male influence. She put Josh in sports for the stability that organized activities offered. At a mere 18 months, he'd already appeared on local TV, hitting drives with a picture perfect golf swing (which his dad had taught him). "The one positive that came out of this situation is my mom and I became inseparable, really. We both kind of lived for one another." Donaldson doesn't dwell on the upheaval. He's speaking about it on this day because a reporter has asked for his views on the Major League Baseball domestic violence policy instituted last summer. With the players' union, baseball reached a landmark joint agreement on domestic violence, sexual assault and child abuse. The commissioner's office pledged to investigate all allegations, independent of criminal probes, with the individual involved, whether player or a staff member, placed on paid administrative leave while the review is conducted. Discipline can be imposed even if there's no criminal conviction. Yankee pitcher Aroldis Chapman became the first MLB player held to that policy. He agreed to a 30-game suspension that will begin on Opening Day. Chapman, one of the game's premier relievers, is alleged to have placed his hands around his girlfriend's neck during an argument in October 2015, and of having fired a gun eight times. In a statement issued after the penalty was announced, Chapman continues to maintain he didn't "in any way" harm his girlfriend. "However, I should have exercised better judgment with respect to my actions, and for that I am sorry." He motions towards the ballpark where his team has just played, and says, "These are grown men on the field here. Domestic violence is a numbers game, right? There's going to be one or two people, just by pure numbers, who are involved in that kind of thing. It's everywhere, in every profession. The more that we can get ahead of this, the more educated people will be and hopefully that makes everyone think. When he was 12, he'd hit into an 8-foot-by-8-foot net in his backyard, taking 300 hacks lefthanded and 300 hacks righthanded. At Faith Academy, he would play in a football game (he was a star cornerback) and afterward meet his baseball coach to get some work in. When he'd go through hitting slumps at Auburn, he'd have his girlfriend feed a pitching machine for him during weekends. Donaldson's childhood playing career was influenced by the father of righthander P.J. Walters, who started coaching him at the age of 7. Donaldson and P.J. later went to play for the same state championship team at Faith Academy in Mobile, Ala.
Josh was bullied in his first high school and then transferred to Faith Academy. He forged a notable competitive streak early on. "Josh was a very active child," Lisa said. "I don't think he played anything that wasn't competitive, even Nintendo. I don't know how many controllers I bought because he'd lose a game and throw them at the TV and break them." Sports helped him corral that out-of-bounds attitude. But it took longer to eliminate a brashness that sometimes rubbed his opponents the wrong way. Some perceived him as egotistical, Donaldson says. He put it this way: "I developed quickly as far as sports were concerned, and I was a very confident kid." In 2004, Josh graduated from Faith Academy in Mobile, Alabama. He was named Alabama Gatorade Player of the Year as a senior after hitting .515 with 21 doubles, six triples, four home runs, and 54 RBI. Joshua also played football for two years as a wide receiver, defensive back (making a school-record 11 interceptions), and punter. And he was a point guard in basketball. He was named the Best Christian Leader Award in 2003 and 2004. "As someone who wasn't the biggest and strongest, I've always thought that I had to outwork everyone else," Josh said. Upon graduation from high school, Josh accepted a baseball scholarship to Auburn University. He was a third baseman until his junior year, when he moved behind the plate. In the summer of 2006, Donaldson was an all-star catcher in the Cape Cod League. He hit .302 for the Harwich Mariners, driving in 21 runs with a team-best 4 homers and 11 doubles. His first season of pro ball, Josh was recognized as the Northwest League's leader in on-base percentage (.470) and he would have ranked first in slugging percentage (.605) if he hadn't fallen three plate appearances short of officially qualifying. In 2008, Baseball America rated Donaldson as the 7th-best prospect in the Cubs' organization. Moved to the A's organization, the Baseball America Prospect Handbook rated Josh as the 13th-best prospect in their farm system. And he was at #14 in the spring of 2010. They had him at #12 in the spring of 2011. But he was down at #20 in the winter before 2012 spring training. 1. He can't believe any of this is happening. "I do remember telling my teachers growing up, 'Hey, save my signature, because it's gonna be worth something someday,'" Donaldson said during a visit to the MLB Fan Cave. "But I didn't really believe it. Like, I was just messing around with them." 2. "The Donaldson" requires trimming every 10 days. And careful with the rat tail, please. That curly wisp of hair is key to Donaldson's Mohawk. "You've got to have the rat tail," Donaldson said of his suddenly (in the spring of 2013) signature coif. 3. His girlfriend Jillian Rose had absolutely no idea he was going to do that to his head when she dropped him off at the ballpark early this season. "He looked like he always did," she said. "Then I was sitting in the stands with the girls. When he first got it done, his hair was so short and one of the girls said, 'I think his head is shiny.' I was like, 'What happened? I just dropped him off!' Then he takes off his helmet and we saw it. "After the game, I'm like, 'Babe, what happened?' I said, 'Who did this?' He said, 'Well, I was doing it myself, and then I started having trouble so [Grant] Balfour helped me out.' So then I saw Balfour's wife, Angie, and I said, 'Hey, we need to talk about doing this before.' It was funny." 4. As a boy, Donaldson was a Braves fan and his favorite player was Ron Gant. Donaldson once saved up three bucks of lunch money to get Gant's rookie card at Big Hit Sports Cards in Spanish River, Ala., right by I-10 near his elementary school outside Mobile. Discovering that a Gant was up to $10, young Josh begged his Mom to spring for the other $7. "That Ron Gant card I have saved and wrapped up in bubble wrap. This was my prized possession." 5. He still loves trading cards so much that when given the option of spending a day off shopping Fifth Avenue with Jillian or going with teammate Pat Neshek to open dozens of Topps Heritage boxes at the MLB Players Association headquarters in Midtown Manhattan, Jillian wound up hanging out with a best friend. Baseball always rules. "This is your thing," she said. 6. He has a nine-pound, tri-color Cavalier King Charles Spaniel toy named Lucy, and loves her. "People are surprised when they see him with this toy dog," Rose said. "He's a big sweetheart. He is. He's a really good guy. He would do anything for any of his friends. He's that guy." 7. He credits Greg Sparks, hitting coach of Oakland's Triple-A Sacramento River Cats affiliate, with the most important lesson he has learned, even when he persistently refused to be taught. "I feel like I am being more consistent every day, as far as [putting the] barrel on balls," Donaldson said. "Oakland can somewhat play as a big ballpark. In the past, I've tried to swing harder. Right now, I'm just trying to focus on barreling the ball up and I'm hitting a lot of doubles. During the course of the year, the home runs will come. It's just something over the course of time you learn a little bit." 8. His girlfriend Jillian Rose is from Cincinnati and is still a devout Reds fan. Shortly after they had met, she was wearing a Joey Votto MVP shirt and came to visit Donaldson one day in Salt Lake City, where she was living. With all due respect, there are no more Reds garments in this relationship. "He was like, 'Babe, what are you doing? You're going to have to cover that up,'" Rose recalled. She told him Votto was a first baseman and he was a catcher (at the time), but he shook his head. "I haven't worn my Cincinnati gear since," she said. To this day, Donaldson is obsessed with baseball cards and memorabilia. Back home in Mobile, Josh has thousands of them, many kept in a safe, including several vintage Mantles. In 2015 he spent a few grand on the complete Topps sets from 1972 through '79. The collecting began when he was a boy; his mom once drove him six hours to Atlanta to for David Justice's autograph. Josh waited near the Braves' parking lot after the game only to watch Justice zoom by in his car. Even now Donaldson remains a signature-seeking fan-boy. Prominently displayed in his den is a framed Miguel Cabrera jersey, signed by the Tigers' star before a game in 2014. "The card I want is the '51 Mantle," Josh said in 2015. "That's his rookie card, and depending on the condition, it can be over a million dollars." The story has been told countless times in his family circle, and even more times outside it. But Josh never tires of hearing Uncle Chuck recount it over and over and over again. Neither does his mother, Lisa. "My brother took Josh into the backyard," Lisa said. "He had never picked up a baseball bat in his life. I had gotten him one of those yellow bats and white little balls." Josh was 4 years old at the time. "My uncle said he was throwing it softly the first couple of times; didn't think I would hit it," Josh said. "Throws it, and whack! Hit it right by his head." Luck, perhaps? That's what Uncle Chuck thought, so he tried it again. Whack! "He hit it even farther," said Lisa, with a smile heard even over the phone. "It's been going on ever since." She pauses, before adding, "Praise the Lord on that one." Through it all, starting when he was drafted by the Cubs in 2007 out of Auburn University, every one of Josh's moves through the chain has been met with speculation as to whether his bat can keep up. Lisa, vocal and outspoken much like her son, pays no mind to this, saying, "I've always felt like I had to stick up for him." Because, at home, no one else really could. Josh's father, Levon, went to prison when Josh was just 5, remaining there for the next 16 years, while Lisa played the role of a single Mom. She thrived on it, managing the books and taxes for her mother's bar in Florida during the days, bringing home some extra money by bartending late nights, and making ends meet. Boxing is another one of Josh's hobbies. Perhaps because he was 6-0, 190 pounds in high school, his prospects in other sports weren't great. So in his junior year, his mother, French, packed up the house in Pensacola, Fla., and moved to Daphne, Ala., where Donaldson would be able to play at Faith Academy, a private school with a good baseball program. "Josh had wanted to go to Faith Academy for a while," French said. "But he couldn't make up his mind. But he'd been coming home from school not very happy for a while. So I put the house up for sale, sold it in two weeks, and within a month we'd moved to Daphne." Why the change? "I'd come to the conclusion that baseball was probably going to be my road to success," Donaldson said. "And I felt like if I transferred to this school, which one of my buddies, P.J. Walters (of the Minnesota Twins), did the year before, it would be beneficial. P.J. told me how much he loved it and told me how much better he felt he was getting." In his senior year, a week before the football season started, Donaldson dropped by practice to see one of his buddies on the team. Just like that, he decided to play football one last time. He set a school single-season record with 11 interceptions as a senior and was invited to play in the state All-Star football game as a receiver. He wound up being named the game's MVP. Then the Cubs drafted him as a catcher, and the A's acquired him at the position. But his heart was at third base. In July 2013, Donaldson was honored as the A's recipient of the Heart and Hustle Award. The distinction, awarded to a member of each MLB team, is voted on by the Major League Baseball Players Alumni Association and given to active players "who demonstrate a passion for the game of baseball and best embody the values, spirit, and tradition of the game." "That's Josh Donaldson," said Ray Fosse, who was a member of the 1973 and 1974 Oakland A's World Series teams and presented the award to Donaldson. "He's a student of the game. He's out here all the time. He plays hard, and he plays the game the right way." "You have to look at what he does on the field and realize that he's a special talent, but he's more than that," Fosse said. "He's the ultimate gamer. He's here all the time. He's like a stadium rat, where he spends a lot of time out here trying to get better. That's a credit to him." "There's a lot of former players who come around here, not only who played for the A's but in other organizations, and they say they enjoy watching me play and enjoy the way I play the game," Donaldson said. That's the biggest honor, when an ex-player comes up to you and gives you that token of appreciation." Donaldson says he would have loved to have seen Mickey Mantle play. As for today, Josh says he'd pay to watch the Mets Matt Harvey pitch. In 2013, Josh drove a Chevrolet Avalanche. Donaldson's favorite actor/actress: Denzel Washington and Jessica Biel. Sports team (other than baseball): Indianapolis Colts. Josh says if he was not a baseball player: "I got my degree in exercise science. So it would probably be something involved with that; maybe coaching. Josh is one of the more approachable players in the game. And he is quick to share credit and praise with his teammates. Three people Donaldson would like to invite to dinner: Kevin Costner, Mickey Mantle, and Robert E. Lee. Golf is one of Josh's favorite hobbies. "My Dad got me into it real early," Donaldson said. "I actually started playing when I was about 18 months old." Josh was even shown on TV as a toddler practicing his picture-perfect swing. But when his father left, so did golf—until he got to the Majors. Now he plays often in the offseason. On May 1, 2010, on the first pitch by Dana Eveland, Donaldson got his first Major League hit, a two-run home run. Josh is the poster boy for a 2014 A's team that is often overlooked in terms of national publicity but doesn't seem to care. Donaldson? He's the one-time catcher who was part of a package the A's got from the Chicago Cubs in the July 2008 deal that sent Chad Gaudin and Rich Harden to the Windy City. He made a big league cameo in 2010, spent all of '11 in the Minors, and then in '12, when he was being converted full time to third base and was in the midst of his second demotion of the year to Triple-A Sacramento, he accepted the challenge of A's player personnel director Billy Owen to play as well in the big leagues as he did in the Minors. Asked to fill the hole at third base in August that season when Brandon Inge went on the disabled list, he contributed to the end of the season run that allowed the A's to edge the Rangers by one game for the division title. Donaldson was named the starting third baseman for the 2014 All-Star Game on July 14, 2015: Donaldson is not only headed to the All-Star Game as the starting third baseman for the American League, but he also shattered the all-time record for most fan votes. Donaldson's vote total (14,090,188) surpassed the previous record, owned by Josh Hamilton (11,073,744). Toronto's slugging infielder also joins Jose Bautista as the only two players in franchise history to lead the league in voting. Josh says it all fits together—the win-at-all-costs hothead, the stickler obsessed with his craft, and the nerd with a wealth of obscure baseball tales. "He just eats, sleeps, breathes, and dreams baseball," says friend and former teammate, Jonny Gomes. "He's a nut, and a rat, all rolled into one." August 21, 2015: They have developed a bond of mutual appreciation as former AL West rivals and All-Star Game teammates, but it's unlikely Donaldson and Trout will ever be buddies. These guys are simply too old school for that to happen. "At the end of the day," Donaldson said, "we're out there competing against each other. I want to beat him and his team, and he wants to beat me and my team. When you're competing like that, you can get that mutual respect. But you know that guy's doing everything he can to beat you. "We've talked a little bit in the All-Star Games we've played together in, and we saw a lot of each other playing in the same division. It wasn't like a huge connection, but what it did was give me huge respect for him and his game." The fiery Donaldson and easygoing, smiling Trout appear on the surface to be personal studies in contrast. But Donaldson believes he and Trout share a common competitive gene. "I've always been very passionate about the game and my competition," Donaldson said. "Sometimes that brings out the emotional side of me, my intensity. He's all about attacking today's game with total focus, which is what Trout admires about him as much as his bat, glove, arm and instincts. "Josh is a great player," Trout said. "He plays the game the right way. I had a ton of respect for him when he was in Oakland, and I feel the same way now." September 4, 2015: Donaldson grew up mostly without his father and turned to coaches, teachers, family friends and others to stay on the right track. Now he wants to do for others what was done for him. Donaldson raised over $80,000 for the Jays Care Foundation and Big Brothers Big Sisters of Toronto on Sunday with his inaugural BaseBowl charity event. Toronto's right fielder started the Bautista Family Education Fund, and has been offering college scholarships to student-athletes for four years now, with 30 currently enrolled in his program. "If you would have told me that I would be what I am today when I was 18, just because [of] a scholarship, I would have called you a liar," Bautista said. "I don't know what the path is going to end up for any of these kids. All I know is I'm bringing them an opportunity that if our help in both guidance and financial aid wouldn't be there, they might not even explore. "That's more of what the purpose of my foundation is, giving kids an opportunity, and in some cases maybe even a choice, because a lot of times kids don't have any other choice. Some do, and this would be another choice, but at least they [get] to make one now to know how they're going to move forward in life." Donaldson didn't have a choice at just 5 years old when his father Levon went to prison, where he remained for the next 16 years. The native of Mobile, Ala., felt limitations because of his situation, but was steered down the road that eventually led him to athletic stardom because of some exceptional people in his life. He hopes his charitable efforts will help children across Canada in a similar fashion. In 2015, Donaldson was named the MLB Player of the Year by The Sporting News. In 2015, Donaldson earned the Hank Aaron Award, representing the best offensive season in the American League. And Mr. Aaron handed Josh the award at home plate before Game 4 of the 2015 World Series at CitiField in Queens. October 30, 2015: Josh took a break from the baseball stuff to answer a question on, of all things, the origin of his Twitter handle, @BringerOfRain20. He says he gleaned it from a TV series titled "Spartacus: Blood and Rain." December 2015: It was announced that Donaldson will grace the cover of Playstation’s MLB 16: The Show. This marks the first time a Toronto player has landed on the front of the United States release. Jose Bautista, Russell Martin and former Blue Jay Brett Lawrie have all been pictured on Canadian covers of the game in the past. December 20, 2015: The hardware continues to roll in for Josh, who was named the Blue Jays' Most Outstanding Player by the Toronto chapter of the Baseball Writers' Association of America. Donaldson was a unanimous winner in the latest of what became a long list of awards. Toronto's third baseman previously won the BBWAA's American League Most Valuable Player Award, the Hank Aaron Award, a Silver Slugger, an Esurance Award for defense and the MLBPA's Outstanding Player. January 23, 2016: In the eyes of Josh Donaldson, his blossoming Major League success can be traced back to one player in particular—former A's and Giants pitcher Barry Zito. "I looked up at the scoreboard in 2012, and he was hitting about 40 points higher than I was, and it made me realize I needed to change a few things," Donaldson said. "I've got to thank Barry for showing up that year and bringing the stick." And with that nudge, Donaldson has since emerged as one of the game's elite players, earning the American League Most Valuable Player Award in 2015. The trophy presentations were held at a private ceremony for players and families after the dinner had to be scaled down due to the severe weather on the East Coast. "It's very special to be in this room, because it's not only great athletes, but there's a lot of great people here," Donaldson said. "I think that's what's most important about this event and for us to be able to be here and receive this. My teammates were probably the most important part of this. They fed off me every day, I was able to feed off them every day. One hundred and sixty-two games is a grueling season. To be a part of it with these guys, I really appreciated going through the grind." (C Thornburg - MLB.com - January 24, 2016). It was a made-for-Hollywood moment that couldn't have been scripted any better. Prior to the Blue Jays' game on April 24, 2016, Lisa French had the opportunity to throw out the first pitch to her son, Josh Donaldson, on his bobblehead day, creating a moment the two of them will never forget. To say Mother's Day came early "would be an understatement," said French, who raised Josh as a single mother. French admitted that there were times when her son was growing up that the mere thought of a moment like this was exactly that -- a thought -- and many years later, those dark times are now a fragment of the past. Instead, the two had a chance to share a memory that will last a lifetime in front of a sold-out and energized Rogers Centre crowd. "It's surreal," French said as she reflected on the moment and all the accolades her son has earned. "It's really unbelievable when you think about it, to see him go through what he went through and work hard the way he did. It's so special as a mom to see him live out the dreams that he worked for every day. I could not ask for anything better, and to top it all off, they're winning the game." Donaldson was presented with his American League Silver Slugger Award, Players Choice Award and AL Outstanding Player Award before the game, and he was given the chance to choose whomever he wanted to throw out the first pitch on the afternoon. French said she found out about the invite on a phone call from her son about a week prior to the game, and that she actually had a dream about it before it happened. Since Donaldson first picked up a baseball at the age of 4, he would work on his game with his mother's brother, Chuck Pyritz. Even as a kid, Donaldson would work at his craft for hours on end, with his mother, Lisa French, having to convince her young baseball star to come back inside, eat his dinner and do his homework. After receiving the news from her son that she was going to throw out the first pitch, it was French's turn to get some lessons from her brother. "I went over to his house to practice and threw like 100 pitches," French said. "I felt good, but then after, I had to 'IcyHot' my arm. It was sore for three days. I didn't want to pull anything, and I definitely didn't want to bounce that ball." French was on target with her pitch, and the two embraced in a warm hug in front of the mound. Although Donaldson is as laser-focused as a ballplayer can be, Toronto's third baseman and the 2015 AL Most Valuable Player Award winner couldn't help but express his emotion about the moment, and his gratitude toward the woman he describes as his "rock" and "best friend." "I know how proud she is of me," Donaldson said. "Before the game, I could see how happy she was. It was a neat moment, and it's tough because you want to be dialed in before the game, but it's a special moment for me, a special moment for her and I won't forget it. "We have a great relationship. To be able to share that, that's a memory that will last a lifetime." Josh took to MLB Network's Studio 42 to break down the mechanics behind his majestic swing, with its large leg kick and sweeping one-handed follow-through. While doing so, Donaldson took the opportunity to debunk some older strategies of hitting, and dish out advice on how to drive the ball like he does. Donaldson is a big fan of the History Channel show "Vikings" -- it was the inspiration for his braided mohawk -- and he even got to make a cameo as a Viking himself in Season 4. 2016 off-season: Josh is not one to slow down. After spending the 2016 season slugging 37 home runs, leading the Blue Jays to the ALCS for the second consecutive year, and collecting two giant bags full of hats rained down upon him in tribute, Donaldson has decided to relax in the offseason by … becoming an MMA fighter, apparently. January 2017: Last winter, Josh Donaldson appeared on an episode of the History Channel series "Vikings" -- both showing off Donaldson's natural charisma and putting to rest any questions about the infamous braid/mohawk hybrid. And 2017 has been a pretty busy offseason for the Bringer of Rain -- but lovers of dingers and Nordic history have no reason to fear: When "Vikings" returns for its fifth season in January, Donaldson's character will make a second appearance. March 18, 2017: When Donaldson is asked about his statistics or personal goals, he almost always steers the conversation back to one thing. "I'm very proud of this organization and our team," he said. "But there's still unfinished business. I want a ring. Plain and simple." That's pretty much the last unchecked box after two seasons in which Donaldson has established himself as one of baseball's best players. In the end, though, it's about finishing the deal. "That's what it comes down to," Donaldson said. "You get measured by championships. I'm lacking that right now. Selfishly, I want that. But for this team and this organization, I think it deserves it." Donaldson's 16.3 Wins Above Replacement are second in baseball during his two Toronto seasons, trailing only Mike Trout (18.3). He has made the American League All-Star team for three consecutive years, and he has averaged 35 doubles, 33 home runs and an .893 OPS over the past four. Donaldson played in pain -- hips, shoulders and body -- down the stretch last season. He kept playing and declined to even discuss his condition. "If I'm out there, there's no need to discuss," he said. "It would sound like an excuse." But that pain spurred Donaldson to a long offseason of work on his core strength and flexibility. He arrived at this camp looking like a guy ready to win another MVP, if not a World Series. "I feel great," he said. "I feel stronger than ever right now. I feel very close." Donaldson tweaked a calf muscle early in Spring Training and is still a couple of days from playing in a Grapefruit League game. But he's taking round after round of batting practice, and he launched one moon ball home run that had teammates buzzing. Sep 1, 2018: Blue Jays general manager Ross Atkins is attempting to clear the air surrounding the series of events that led to the trade of star third baseman Josh Donaldson. In an interview, Donaldson stated that he "completely ruptured" his left calf muscle while rehabbing in Florida. He also seemed to suggest there was a disconnect between himself and the club's medical staff, and that he would have a lot more to say at a later date. Atkins responded. "All we've done, is tried to add resources," Atkins said during a conference call with reporters. "Physical therapists, more medical support, nutritionists, sleep therapists, massage therapists. More resources. What we try is to have the best for the players, and ultimately, Josh decided this past offseason to follow his own path. "He was not using our resources during the offseason, which was fine with us. We support him 100 percent in his desire to do that. There's certainly not a disconnect internally, but I think when players are being traded there is a level of emotion." Donaldson's decision to stick with his own program, instead of one outlined by the team, shouldn't be surprising because the former American League MVP made it abundantly clear he would be doing just that during a scrum with the media at the end of the 2017 season. The veteran third baseman did not appear to be happy with the way his injured left calf was treated and vowed to follow his own routine in the future. A couple of weeks later, Atkins conceded there was a "communication breakdown" as the club looked to integrate an innovative high-performance department with more traditional athletic training procedures. The so-called communication issues led to a series of personnel changes during the offseason. Atkins conceded mistakes were made, but stressed they were fixed long before the 2018 season began. Donaldson apparently does not agree, but Atkins believes the Blue Jays did everything they could. "He was driving the timelines to push," Atkins said. "When he wanted to take the next step, that was completely his call. When he wanted to play, that was completely his call. We were making suggestions in and around the treatment and therapy. "At one point he did decide to get external consultation, which we 100 percent supported. We flew him to that external consultation, and that person was another piece in the equation, in trying to help his return to play as quickly as possible. We're providing the best resources we possibly can." Donaldson is expected to address his side of the story in the near future as questions continue to linger about why he went from being listed as day-to-day in late May, to essentially disappearing from Toronto for upward of three months, because of what the club consistently described as calf tightness. Blue Jays fans will have to wait a little bit longer before the player to be named later is officially announced. According to the Cleveland Plain Dealer, the player is expected to be right-hander Julian Merryweather, who underwent Tommy John surgery during Spring Training. The 26-year-old posted a 5.32 ERA in 25 starts at Double-A and Triple-A last season. "There were four solid teams in play," Atkins said when asked about the market for Donaldson. "Four teams with solid interest. We had very good alternatives and this was the best return. That's what it came down to. It was very close. It was a very difficult decision for us and ultimately decided this was the best return." It was believed for weeks that the Blue Jays and Donaldson were headed for a breakup because Toronto's front office wanted nothing to do with an approximately $18 million qualifying offer to Donaldson at the end of the season. While that would have guaranteed a compensatory Draft pick if Donaldson left for another team, the Blue Jays did not appear willing to risk that he might accept. That notion was disputed by Atkins during the conference call. He claimed the decision to part ways with Donaldson did not have anything to do with next year's budget, and instead was about making the most of the options at Toronto's disposal in the current moment. Sep 21, 2018: Josh Donaldson was in search of a way to expedite a rehab process that had been frustrating, prolonged and included setbacks. Roughly two weeks before the Indians acquired the third baseman from the Blue Jays, Donaldson flew to Minneapolis in search of another opinion about his left calf issues. The mid-August trip was to consult with Dr. Josh Sandell, who is a sports medicine specialist for the NFL's Minnesota Vikings. Sandell came at the recommendation of Donaldson's good friend, NFL wide receiver Larry Fitzgerald. Donaldson said he and the soft-tissue specialist discussed integrating some different approaches to the third baseman's schedule. "Two days after I saw him, that was the first time I was able to start running, and I ran my longest distance while accelerating probably without any pain," said Donaldson. Donaldson was in the lineup for Cleveland as the designated hitter, marking the first of three consecutive games for the third baseman, barring anything unexpected. Since activating Donaldson from the disabled list on Sept. 11 -- following the Aug. 31 trade with Toronto -- the Indians have been building in off-days in an effort to build his endurance up for everyday work in the playoffs. So far, Donaldson has passed every physical test presented in workouts and games. "I've felt great with it," Donaldson said. "The more positive reps that I can continue to gain, the more trust in that I'll continue to have. I haven't opened it up 100 percent yet on the basepaths, but I'm sure that'll come with time." Offensively, Donaldson has had a lot of loud outs since joining the Tribe, but he was just 3-for-18 with one homer in his first seven games for his new club, entering the series with the Red Sox. He said he feels that his pitch recognition has been strong and his timing is coming along, too. Heading into this weekend series, Donaldson had seven hard-hit balls (95-plus mph) out of 14 balls in play with the Indians, per Statcast™. "It's not easy," said Indians manager Terry Francona, referring to a player finding an offensive rhythm after missing multiple months. "That's why we're trying to play him enough, without playing him too much -- so he has the best chance to have the best timing he can have." Donaldson said he feels close to full strength physically, though, and he credits Sandell for playing a large role in that process. After initially being sidelined in late May, Donaldson sustained a severe setback while fielding ground balls at Toronto's spring complex in Florida. After meeting with Sandell, the third baseman made changes to his diet to aid in the recovery process. Donaldson noted that the doctor also used stroke therapy (techniques typically for stroke victims) in helping treat the third baseman's injury. "He's pretty innovative," Donaldson said. "[He does things] to help guys kind of gain back muscular function and nervous-system function throughout the process. ... What he was able to do was kind of re-hardwire my nervous system while using this type of therapy, to where I could start moving and running and stuff more freely and more naturally." The hope now is that Donaldson will only be focusing on the games -- rather than any rehab work -- by the time October arrives. "It's been very easy for me to kind of come in and fit in," Donaldson said. "And, hopefully, [I can] help this team to accomplish its end goal." (J Bastian - MLB.com - Sep 21, 2018). Nov 27, 2018: By signing Donaldson to a one-year, $23 million deal, the Braves have added much-needed power to their batting order, enhanced the potential value of their previously-thin bench and created some clarity regarding other offseason needs. "We couldn't have found a better fit for this club," Braves general manager Alex Anthopoulos said. "He really was the key guy for us in the offseason. We were pretty determined to get a deal done." One day shy of the four-year anniversary of when he brought Donaldson to Toronto via a trade with Oakland, Anthopoulos welcomed Donaldson to SunTrust Park to introduce the third baseman as the newest member of a Braves club that seems capable of building upon this year's division-winning success. "Coming into the offseason, I knew there was a possibility of Alex and I linking back up and being part of the Braves," Donaldson said. "He made it very clear early on this is what he envisioned, and he was going to do his very best to do that. Here we are today. I'm very thrilled." Having grown up in Florida and Alabama as a Braves fan who adopted Ron Gant as his first favorite player, this is a dream come true for Donaldson, who is confident he can bounce back from his injury-wrecked 2018 season and re-establish himself as one of the game's most feared hitters. From '15-17, he averaged 37 homers per season and ranked fifth among all Major Leaguers with a .946 OPS. "Without a doubt, I still feel like I'm that type of player," Donaldson said. "I'm not really concerned about anything more than today. I'm focused on being the best I can be for this organization." Lack of confidence has never been a concern regarding Donaldson, who responded to a question about switching leagues by saying, "Check my numbers against the National League." Anthopoulos responded by smiling and saying, "He hasn't changed a bit." Donaldson earned the AL MVP Award in 2015, his first season with Toronto and Anthopoulos' last as the Blue Jays' GM. The 32-year-old third baseman earned four consecutive top 10 AL MVP Award finishes from '13-16, and he might have gained a fifth had a right calf strain not sidelined him for six weeks in '17. His vision of gaining a lucrative long-term contract this 2018 offseason faded as he missed nearly three months this past summer with a left calf strain. Though the post-disabled list sample size was small, Anthopoulos saw enough to believe Donaldson is indeed still capable of being a difference maker on the field and in the clubhouse. Both parties are encouraged by the fact that the third baseman will also now be reunited with George Poulis and Mike Frostad, who served as his athletic trainers during his first three seasons with Toronto. Feb 9, 2019: Considering Josh Donaldson spent much of this decade serving as a chief threat to Mike Trout's annual MVP bid, there's certainly reason to anticipate him becoming the Braves' best free agent acquisition since Greg Maddux came to Atlanta. But to gain this distinction, Donaldson must re-establish himself as the offensive monster he was before a right calf strain sidelined him for most of the first two months of 2017 and a left calf strain forced him to miss most of last season. "People say, 'He's been hurt' and I'm like, 'It was one year,'" Braves first baseman Freddie Freeman said. "The guy has like a .950 OPS for four straight years and a MVP. I can't wait. He's going to be a huge lift. He's healthy and ready to go. So, I don't see why he can't be Josh Donaldson again." When the Braves open Spring Training, their bid to defend their National League East crown will be significantly influenced by whether Donaldson is capable of reestablishing himself as one of baseball's elite superstars. Donaldson hit .282, belted 164 homers, compiled a .901 OPS and produced a 36.1 bWAR (Baseball-Reference's Wins Above Replacement model) from 2013-17. The only other players with a bWAR of at least 30 within this five-year stretch were Trout (43.1) and Paul Goldschmidt (30.9). Trout was also the only other Major Leaguer to hit at least .280 with 150-plus homers and a .900 OPS over the course of these years. Had Donaldson been a free agent last winter, he likely would have gained a lucrative multi-year contract that would have provided him financial certainty into his late 30s. But after the calf injury limited him to 52 games (16 after May 28) last year, he accepted the one-year, $23 million deal that reunites him with Braves general manager Alex Anthopoulos. While serving as the Blue Jays' GM, Anthopoulos acquired Donaldson from the A's. Their only season together proved to be quite memorable, as the third baseman won the American League MVP Award and Toronto advanced to the AL Championship Series. "The number one priority was getting what we thought was a guy who could be a middle-of-the-order type of bat," Anthopoulos said. "We weren't looking for a third baseman. We just wanted a big bat with power. Then, you start factoring in the way he plays, the way he prepares, the example he sets, the edge he brings and how tough he is. He's just going to make players around him better." Braves manager Brian Snitker is currently leaning toward filling the first four spots of his lineup in this order: Ender Inciarte, Donaldson, Freeman and Ronald Acuna Jr. Donaldson has four top-10 MVP finishes within the past six years and Freeman has three. They team with the 20-year-old Acuna to give Atlanta a fearsome trio of potential MVP candidates for the upcoming season. Provided a chance to play closer to his Auburn, Ala., home and for the team he loved throughout his childhood, Donaldson will attempt to reignite his career while feeding off the intense warrior-like personality that inspired his Twitter handle: @BringerofRain20. Donaldson chose the handle after watching a Starz series titled Spartacus: Bringer of Rain. Spartacus' victory over a legendary gladiator in one episode leads to the end of a long drought in his land. Now in Atlanta, Donaldson will attempt to end a drought that extends back to 1995, when he was a 10-year-old kid who rejoiced the night a David Justice homer was enough to support Tom Glavine's World Series Game 6 masterpiece. June 2007: The Cubs chose him in the first round of the supplemental draft, out of Auburn University. He signed with scout Bob Rossi for a bonus of $652,500. July 8, 2008: The A's sent pitchers Rich Harden and Chad Gaudin to the Cubs; acquiring Donaldson, P Sean Gallagher, OF Matt Murton, and INF Eric Patterson. February 13, 2015: Donaldson lost to the Blue Jays in salary arbitration, getting $4.3 million instead of the $5.8 million he sought. February 10, 2016: Donaldson and the Blue Jays avoided arbitration, agreeing to a two-year contract worth $28.7 million. Jan 12, 2018: Donaldson and the Blue Jays avoided arbitration by agreeing to a record-setting pre-arbitration one-year deal worth $23 million (all figures in U.S. dollars). The one-year deal surpasses the previous arbitration record, which was set in 2017 by Bryce Harper's $21.6 million contract for the 2018 season. Because he was traded, Donaldson will no longer be eligible to receive a qualifying offer this offseason -- likely to be valued somewhere between $17 million to $18 million. He will be an unrestricted free agent, meaning that the club that signs him will not need to forfeit a future Draft pick and the Indians won't receive any picks as compensation if they lose him. Oct 29, 2018: Donaldson elected free agency. November 26, 2018: Josh signed a one year, $23 million contract with the Braves. Donaldson has very good righthanded pull power, but is able to use the whole field, adjusting when he falls behind in the count and hitting the ball to the opposite field using a shorter, less aggressive stroke. He has strong hands and above average bat speed. His bat is strong. In 2015, he averaged an exit velocity of 98.7 mph on fastballs he nailed. Josh squares up the barrel of the bat on the ball very well. Donaldson is an aggressive hitter. But he controls the strike zone well. Josh has good plate discipline. He has a good feel for the strike zone, and for hitting, and uses the whole field. Donaldson says he will choose a half of the plate to cover, then use that half before getting to two strikes. In 2013, A's hitting coach Chili Davis said of Donaldson, "When his approach is calm, he has better pitch recognition. He gets pitches to drive, and he drives them. In hitter's counts, he's aggressive. In two-strike counts, he uses the whole field. He's starting to understand what makes Josh Donaldson a better hitter." May 26, 2015: Donaldson became the first player in Toronto franchise history to have at least four hits, four RBIs, and four runs scored in the same game. 2015 Home Run Derby: For Bobby Tewksbary, the road to the Home Run Derby started in Worcester, Mass., where he and Chris Colabello were teammates in the independent Can-Am League in 2006 and 2007. Tewskbary lasted just those two years in the league and was done at 23. He was not much of a hitter, but he loved to study hitting, and when he started his own business—teaching hitting—Colabello was one of his first pro pupils. Colabello soon became an avid disciple. The all-star third baseman had an invitation for his personal hitting instructor: come to Cincinnati and be my pitcher in the Home Run Derby. July 10, 2016: Donaldson cranked his 23rd home run of the season, becoming just the sixth player in AL history to record 20 home runs and 80 runs scored before the break. The 30-year-old joined an elite class which includes Lou Gehrig (1936), Ted Williams (1946), Reggie Jackson (1969), Frank Thomas (1994), and Alex Rodriguez (2000). Donaldson has the longest recorded home run by a Blue Jay April 23, 2015, vs. BAL; Sept. 17, 2017, at MIN. As of the start of the 2019 season, Donaldson had a .275 career batting average with 182 home runs and 551 RBI in 3,292 at-bats in the Majors. Donaldson grew up in Pensacola, Florida, before his family moved to Mobile, Alabama to begin his junior year in high school. He played mostly shortstop through high school, then played short and third his freshman year at Auburn. For his sophomore year, the Tigers turned to Donaldson in order to fill a much needed void. "I was kind of playing around at catching, and the coaches brought me in and asked me if I wanted to catch a little," he said. Josh had quick feet and a strong arm behind the plate. He has decent catch-and-throw skills. He is more athletic than most catchers. Experience is giving Josh time to improve his receiving skills. He has good hands. Josh has solid instincts for the game. He plays baseball the right way. He was an aggressive catcher. He has some agility and had a good feel for catching. Donaldson has a strong arm and a good, clean and quick release. But he could stand to improve the transfer on his throws. In 2007, Josh threw out 40 percent of Northwest League runners who tried to steal a base on him. In 2008, Donaldson threw out 37 percent of base-stealers in the Midwest and California Leagues, combined. In 2009, he nailed 40 percent of Texas League base thieves. In 2010, he erased 39 percent of Pacific Coast League base-stealers. Donaldson has a lot of intangibles and is a hard worker and a team leader. He is a vocal guy. In 2011, Josh saw a lot of action at third base. In the offseason before 2013 spring training, Donaldson trained ferociously for full-time duty at third base. He turned himself into not just a competent infielder, but a superb one, according to A's manager Bob Melvin. Donaldson, like most infielders, is especially particular about his mitt. Once he's found one he's comfortable with, he protects it like a treasure. "I have my gamer from 2013 that I'm still using now, and I won't play catch with it or practice with it because it's good right now," Josh said. Donaldson prefers Rawlings gloves because he feels the leather on their models is more durable. The breaking-in process for his backup glove, the one he plays catch and practices with, has been ongoing since spring. In 2014, Donaldson was named the best third baseman in baseball, winning the annual Fielding Bible award. In 2014, Donaldson finished the month of May with a Major League-leading 48 runs scored, the most at that point in the season in the history of A's baseball. 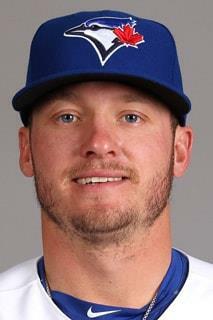 August 5–early September 2010: Donaldson was on the D.L. with a sprained right knee that he incurred on a slide into second base. An MRI showed a sprained medial collateral ligament. Feb 17, 2017: Donaldson has a right calf strain and will be evaluated daily throughout Spring Training. He is expected to be ready to start the season. He was injured while doing sprinting drills and said he "felt something" in his calf. He was scheduled to undergo an MRI. April 14-May 26, 2017: Josh was on the 10-day DL because of his right calf strain. April 11-May 3, 2018: Josh was on the DL with right shoulder inflammation. May 29, 2018: Josh was on the DL with left calf tightness.June 28, 2018 : The Blue Jays received discouraging news about third baseman Josh Donaldson, whom they were hoping would be ready to rejoin the team at some point during an upcoming homestand that began June 29, 2018. Instead, they'll have to continue on for a while longer without him. Donaldson, while preparing to play a rehab game in Dunedin, Fla., sustained an injury to his left calf while taking ground balls. An MRI revealed acute strain of his calf muscle, and he'll be reevaluated in three weeks. Sept 1-11, 2018: Josh was on the DL with left calf strain.